Having total access to all your email files regardless of whatever Windows OS you are currently using should always be a top priority for anyone who is always keen on maintaining a healthy archive of important email files and retain effective communication channels without any form of restrictions. Microsoft Outlook is definitely one of the most widely used email clients, but quite unfortunately, there are a lot of email storage formats and this tends to be a problem for those with computer systems running on the Windows OS as they could face a hurdle trying to convert eml files to Outlook in order to have any chance of decoding the information stored in the mails. 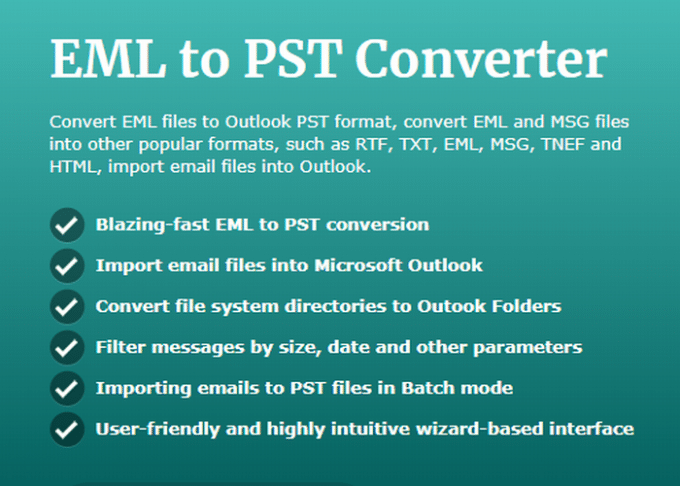 You can now keep track of all your emails and ensure that you never miss any information by using the powerful conversion ability of our EML To PST Converter, it is professionally designed to give you excellent and absolutely flawless conversion of various email files generated from an extensive array of email applications. This professional office tool migrates your mails seamlessly into outlook with very high speed efficiency, thus saving enormous time and unnecessary stress in managing your email archive and giving you extra control with its versatile application which can be used to convert EML files into MSG format and vice versa, convert EML and MSG files into other widely used formats which include HTML, TNEF, TXT, RTF, and PST. You can also effectively convert .MBOX or .MBX files into .EML and then proceed to .PST. The most important factors in using this professional converter are the time-saving factor which works with supersonic speed without compromising the content of your mail, and its ability to be extensively applied to a very large number of email formats and extensions even those with password protection. EML to PST Converter installation package arrives with a free mbox to eml converter with a new support feature of the Mac OS X .EMLX format extraction. This article was posted in Eml to pst converter.